It is twenty one months since Midlothian View first reported on the Sheriffhall roundabout improvement decision process. The decision has since been delayed three times. 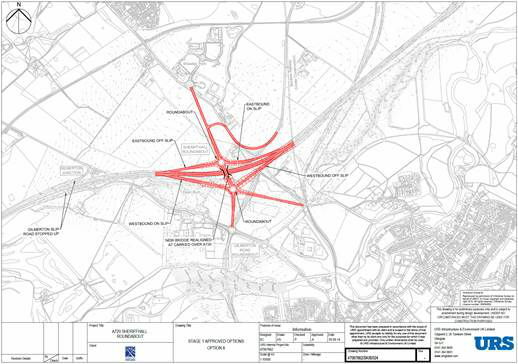 Following a meeting between Colin Beattie, Midlothian and North Musselburgh MSP and the Scottish Transport Minister, Humza Yousaf MSP, Mr Yousaf has today confirmed in a letter that the junction improvement options are expected to be presented to the public for comment later this year. Mr Yousaf also confirmed in his letter that the options assessment process will be completed by the end of the 2016/17 financial year. So perhaps Midlothian and Edinburgh commuters should not rejoice too much and too soon given there are no timescales for when the improvements will actually be started or completed. “I warmly welcome this news – we can now begin to see light at the end of the tunnel. 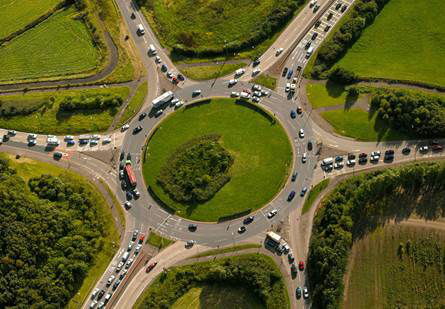 “The process of improving Sheriffhall Roundabout has been protracted through circumstance. I’m sure I’m not alone in being frustrated at these delays. “However, when I met with the Minister he assured me that plans are moving forward and that we can expect to see substantial progress over the next few months. Currently, Sheriffhall roundabout is the only junction on the A720 Edinburgh City Bypass which is not grade separated. Grade separation being the term used to describe roads at different heights. The roundabout at Sheriffhall can lead to significant localised queuing, especially during the morning and evening peak periods. 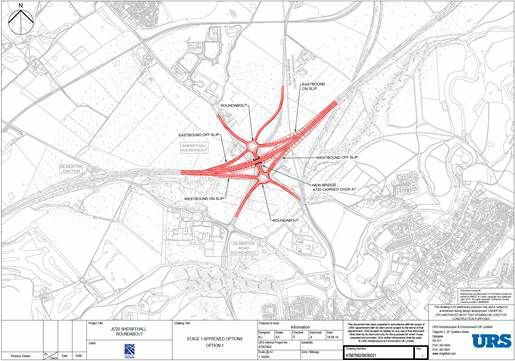 Junction improvements at Sheriffhall were identified as part of the Strategic Transport Projects Review (STPR), published in December 2008. The six-arm roundabout has undergone various improvements, including localised widening, the provision of additional lanes, and traffic lights to try to alleviate the delays and long queues. Further improvements are complex due to a number of factors. The area is underlain by numerous historical mine workings, and a geological fault which underlies the Roundabout. Although there is no longer any deep mining activity at Sheriffhall, potentially significant issues with ground conditions remain to be investigated, with mineral seams, fault zones and mine shafts all potentially within the area. The Borders Railway now passes beneath the A720 Edinburgh City bypass via a tunnel approximately 300m east of the Sheriffhall Roundabout. Consulting Engineers, URS were appointed in June 2013 to undertake a Stage 1 Assessment. The principal aim of which was to identify a range of grade separation improvement options. 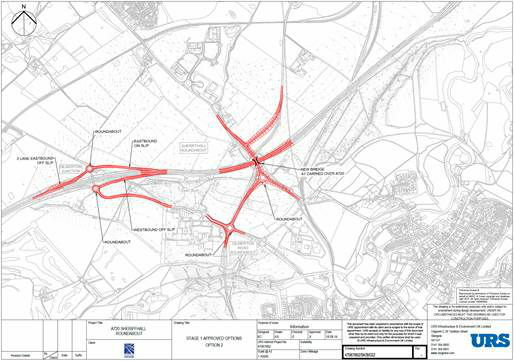 The study examined traffic flows in the area, as well as considering how a new grade separated junction would interact with the adjacent A720 junctions, including the Millerhill Interchange at the northern end of the A68 Dalkeith Bypass. Of the eight junction options which were reviewed in accordance with the Stage 1 Assessment processes four are being taken forward into Stage 2, namely Options 1, 2, 6 and 8. It is the preferred option coming out of Stage 2 that is now due by March 2017.